This Friday, I am cataloging my morning cup of coffee. This is partly due to my recent visit to the store from whence the coffee came, as it was purchased this past weekend from my most favorite coffee supplier in the world (who happen to be from my home town): The House of Coffee Beans in Houston, Texas. Relevant information for context: my morning cup of coffee consists of my new favorite mug, Guatemalan Antigua medium-roast coffee, and Morning Fresh Dairy milk. 300 1 cup of coffee :|bcol. ;|c12 oz. 521 For those who believe that if Folgers is ever “the best part of waking up” … there’s no point in waking up. 600 1 0 Crockett, Davy, |d1786-1836. 650 0 Coffee roasting industry |zHouston. 650 0 Dairy farms |zColorado. 710 2 House of Coffee Beans. 710 2 Houston Museum of Natural Science. 710 2 Morning Fresh Dairy. Neither “facetiousness,” nor any of its derivatives, are Library of Congress authorized subject headings. I believe this to be an oversight. 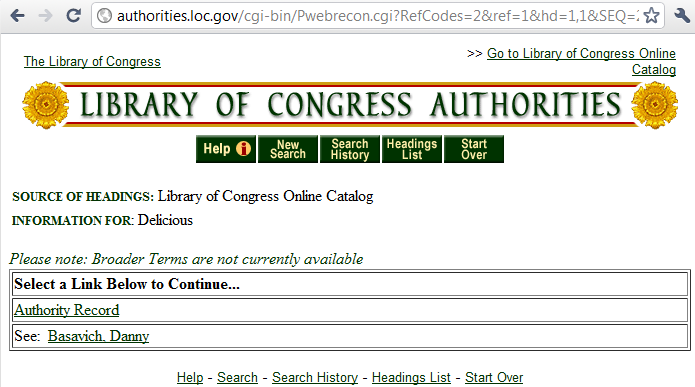 If one searches for “delicious” in the Library of Congress Authorities, the user will be referred to Danny Basavich. *Disclaimer: This record, in all its hypothetical wonder, was not actually entered into any existing catalogs. Any mis-appropriations of MARC fields are not intended to offend any catalogers that have more experience than myself in cataloging beverages.